The water was receding Friday at a flooded Houston-area chemical plant where highly unstable compounds blew up after losing refrigeration, with a fire and thick black smoke billowing into the air Friday evening, company officials said. Flames and smoke could be seen coming from the Arkema plant in Crosby for a second day after a container of organic peroxides exploded and caught fire early Thursday, sending acrid smoke into the air. An executive had said up to eight more containers could burn and explode. Arkema says Harvey's floodwaters engulfed its backup generators and knocked out the refrigeration necessary to keep the compounds from degrading and catching fire. The Environmental Protection Agency and local officials said an analysis of the smoke that came from the plant early Thursday showed no reason for alarm. No serious injuries were reported. Still, authorities evacuated an area around the plant. Emergency crews continued to maintain a 1 1/2 mile buffer around the plant that was established earlier this week when Arkema Inc. warned that chemicals kept there could explode. While billowing black smoke poured out of the Crosby plant Friday, Arkema spokeswoman Janet Smith reiterated statements executives made earlier in the day that the remaining containers of organic peroxides would explode and that the safest course of action is to simply "let these fires happen and let them burn out." Harvey's floodwaters engulfed backup generators and cut off the refrigeration necessary to keep the organic peroxides, used in such products as plastics and paints, from degrading and catching fire. Employees had been pulled, and up to 5,000 people living nearby were warned Tuesday to evacuate. Early Thursday, two blasts blew open a trailer containing at least 2 tons of material, sending up a plume of black smoke and flames 30- to 40-foot high in the tiny town of Crosby, about a half-hour from Houston, authorities said. No serious injuries were reported, but 15 sheriff's deputies complained of respiratory irritation and were released after being examined at a hospital. The Texas environmental agency called the smoke "especially acrid and irritating" and said it can impair breathing and inflame the eyes, nose and throat. Additional small blasts, or "pops," were heard coming from the plant Thursday night. But it wasn't clear if they were caused by exploding containers or pressure releasing from valves, Rachel Moreno, a spokeswoman for the Harris County fire marshal, said Friday. 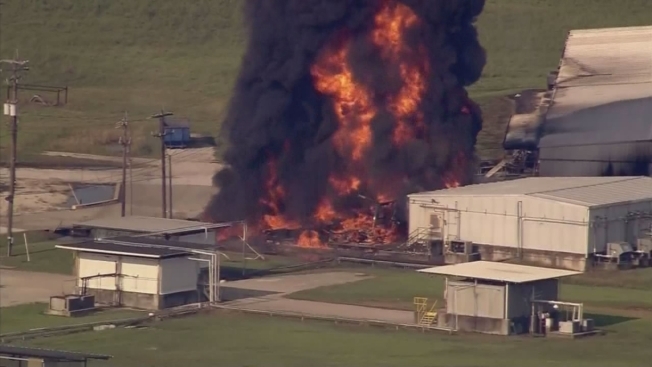 Arkema officials said they expected eight other trailers of organic peroxides to explode at any time. Like Thursday, the damage should be limited to the plant's property, they said. In a conference call with reporters Friday, Arkema's president and chief executive, Rich Rowe, apologized and said he was sending a team of employees to Crosby to figure out how best to assist locals. "I realize this is not a situation that we can help remedy overnight," he said. Questions persisted Friday about the adequacy of Arkema's master plan to protect the public in the event of an emergency in flood-prone Houston, a metropolitan area of about 6 million people. The plant is along a corridor with one of the nation's greatest concentrations of refineries, pipelines and chemical plants. A 2016 analysis led by Texas A&M University researchers identified Arkema's facility as posing one of the region's biggest risks, based on such factors as the type and amount of chemicals and the population density. "This should be a wake-up call (for) all kinds of plants that are storing and converting reactive chemicals in areas which have high population densities," said Massachusetts Institute of Technology expert Nicholas Ashford. In accident plans Arkema submitted to the Environmental Protection Agency in 2014, executives said a hurricane and a power loss were potential hazards. Yet the plans, which were supposed to address worst-case scenarios, didn't explain what Arkema would do if faced with either. Executives also acknowledged Friday that they didn't have materials at the plant that could have neutralized the organic peroxides. Instead, workers were forced to scramble and move the chemicals away from floodwaters after buildings were engulfed and power was lost. Workers transferred the compounds to refrigerated containers, but those failed, too, causing Thursday's fire. Arkema officials had not directly notified local emergency managers of the generator failure, said Moreno. The plant's workers told the Crosby Volunteer Fire Department about it when they were rescued during the storm, she said. Despite receding waters, Arkema vice president Daryl Roberts said he didn't think refrigeration systems would restart, but the organic peroxides were a safe distance from other hazardous chemicals. After days of questions about what was in its chemical inventory, the company posted a list of them on its website Friday, though not the amounts on hand. Asked why it hadn't shared the information sooner, Rowe said, "We're managing our way through a crisis." Texas' environmental commission penalized the plant at least three times. In June 2006, Arkema had failed to prevent unauthorized emissions during a two-hour warehouse fire. Records show a pallet of organic peroxide was poorly stored, resulting in the blaze, and more than a ton of volatile organic compounds were discharged. More recently, the U.S. Occupational Safety and Health Administration in February fined Arkema nearly $110,000 -- later reduced to just over $90,000 -- because of 10 serious safety violations found during an inspection. "We don't have a perfect record, we understand that," Arkema's Rowe said. "We strive to get better at every turn and will continue to do so."